In all, he went 12-3 with a 2.21 ERA in 17 starts in the first half, striking out more than a batter per inning. He occasionally was bit by occasional struggles with his command - for example, he allowed no hits in one start May 14 and struck out eight hitters, but lasted just four innings after allowing five walks en route to throwing 87 pitches - but he made adjustments in that area as well, walking just 20 hitters in 70 2/3 innings in what would be his final 11 starts for Portland. 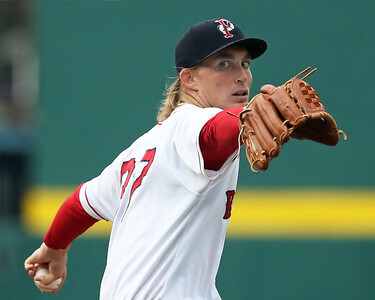 He was named to the Eastern League All-Star game as well as the Futures Game, earning the start in the latter (manager Tom Kelly admitted this was because his win total was highest on the team) and hurling a scoreless inning. Scouting Report and 2015 Outlook: Listed at 6-foot-6, 205 pounds, Owens is a tall, lanky, left-handed pitcher with room for added strength. His long limbs, short arm action, and angle towards home create exceptional deception in his delivery. He uses a three-pitch mix with his fastball, curveball, and changeup. The fastball generally sits between 87-90 mph, and he can reach back for 91-92 when needed. The fastball is wild within the zone with fringe-average command. The pitch grades about average and has future plus potential with improved command and added strength gains generating an uptick in velocity. The changeup is his best secondary offering at 77-79 mph. The pitch grades well above-average with late drop and fade away from left handed hitters. He has great feel and control of the pitch, and a willingness to throw it in any count, to both righties and lefties, and to both sides of the plate with confidence. His third offering is an average-grade curve ranging 71-75 mph with long, loose 1-to-7 break. The pitch showed improvement late in the year - a point he was vocal about in interviews. It flashed above-average potential with some tighter break, and and Owens showed an ability to throw it for strikes.